I've been helping a girlfriend (this woman is amazing - she gives so much - from being on the ground during the Tsunami aftermath to visiting Cambodian orphanages and plenty in between) out with one of her charity passions Geraldine Cox's Sunrise Children's Villages in Cambodia. Two campaigns are being run by this new friend Sue Liu over the next few weeks. 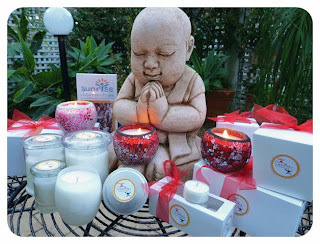 Buy gorgeous handpoured candles as Christmas gifts and help a community! Give good, smell good, do good. Make an impact on the recipients with a gorgeous handcrafed gift and on Sunrise Children's Villages, Cambodia with 50% of profits donated. I helped to make some of the free gift bonus candles the other day. They smell divine and are so beautifully wrapped! If you can help out please do. Candles make gorgeous presents and it will go even further with Candles For Community.